When National Geographic Learning wanted to put digital design and UX practices at the heart of their organization, Mightybytes helped them design a process for continued success. Here’s how. The National Geographic Learning team employed a traditional publishing process in which digital products were created based on their print counterparts. Yet K-12 students increasingly learn in digital-centric classrooms. To address this shift and meet important organizational business goals, the company wanted to flip their process and put digital learning at its heart. This would require a fundamental shift in how they produce products. Many hands filled many whiteboards to execute this project. Designing the new process was iterative and dependent on feedback from several internal committees to get buy-in and make improvements. The entire process was reviewed several times by a variety of key stakeholders. Once the process was approved, we also ran two workshops to train the entire National Geographic Learning team on differentiations between print and digital projects and common UI/UX design practices. 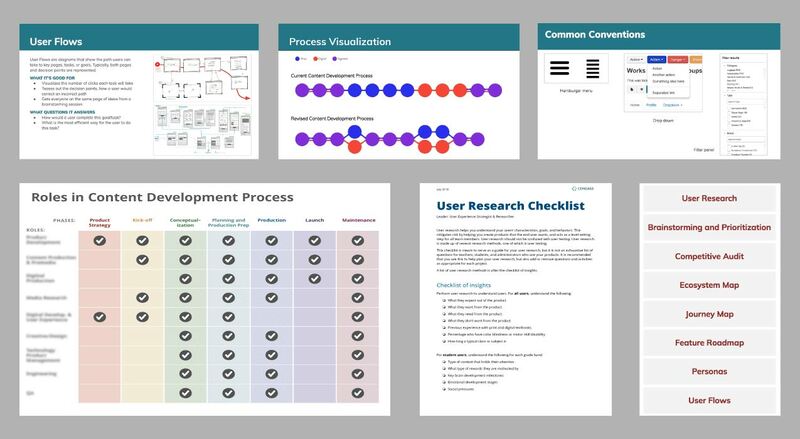 Example slides (top) and checklists (bottom) delivered as part of this project. Our UX consulting engagement with National Geographic Learning lasted for six months. Regular budget reports and conversations about re-prioritizing deliverables when necessary helped us keep the project on track while also identifying new opportunities. After all our presentations, guides, and checklists, the final deliverable for this project was a roadmap with recommendations for integrating the new process into existing workflows. During our work with National Geographic Learning, we retooled the company’s internal processes to prioritize user experience and help them transform into a digital-first developer of high-quality educational products. Encouraged by the productive partnership, their team extended our engagement and contracted us for several other UX-specific projects as well. We look forward to seeing how National Geographic Learning builds success upon these efforts.